This school holidays has seen this correspondent visit some parts of NSW that are off the beaten track. I can safely say that until I saw the town of Bigga on a road sign, I’d never heard of it. Bigga is a village 100kms north, north west of Goulburn off the road between Goulburn and Bathurst, which I don’t reckon would be well travelled. We were staying at a wonderful farmstay about 26kms away called Markdale. Bigga boasts on its welcome sign that it is famous for its superfine Merino wool. For town of less than 200 people it has an impressive looking pub and a golf course. Despite the large size, the internal layout is very old fashioned. 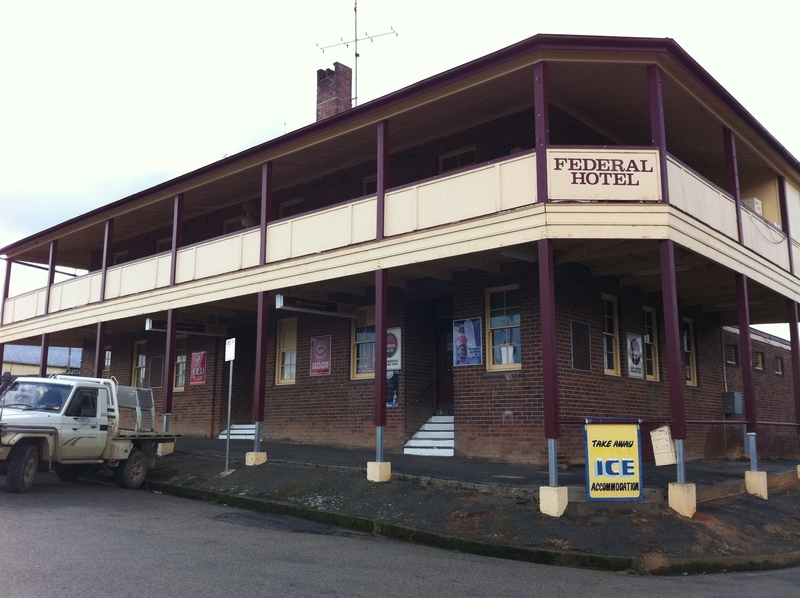 The front bar of the Federal Hotel is where the action is and is very compact. 3 of us walked in for a beer and a look at the first half of the Ireland-Wales quarter-final. I can’t say we were welcomed with open arms when we pushed open the doors. About 10 citizens were gazing up at a blank screen. “Rugby not on?”. “Nah, Bathurst ain’t on”. “Can we watch the Rugby?” Long pause “‘spose so, given Bathurst ain’t working”. Once the rugby came on 70% of the bar left for a smoke out the back. Still, despite the frosty welcome the Old on tap was as good as I’ve had anywhere. 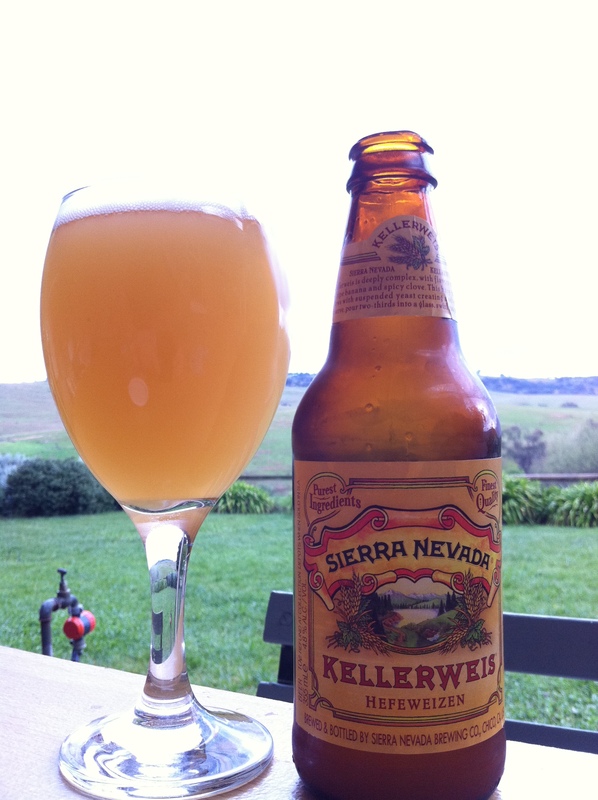 Back at the ranch, I cracked a stubbie of Sierra Nevada‘s Kellerweis. 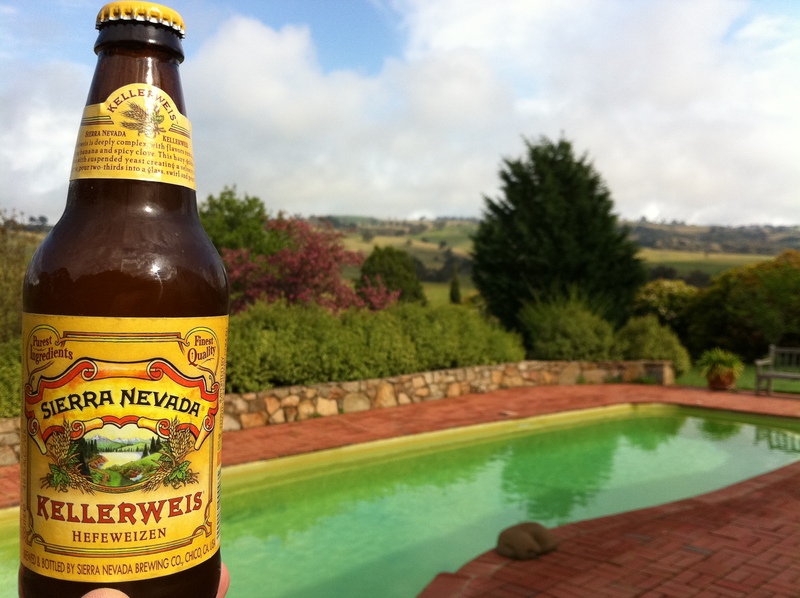 Sierra Nevada started as a craft brewey in 1980 and is now one the top 10 brewers by size in the US. Like many US craft brewers they produce a number of specials and seasonals, but Kellerweis, which is a Hefeweizen, is one their year round offerings. It is a classic hefeweizen – cloudy in appearance and very fruity on the nose. The label promised banana and that was there in abundance. In hot weather this would be terrific – plenty of complexity, but still a crisp finish. Finally, I’ve watched the two Sunday quarter-finals of the World Cup. Firstly, any of the four teams left could win the whole thing. New Zealand should remain favourites, but they are no sure things. The Wallabies can count themselves extremely lucky. No-one can doubt the courage of this team – but one can question the intelligence. The strategy appeared to be Let us prove to the World that we can tackle better than anyone else. We’ll prove that by giving the ball back to the Springboks over and over again and inviting them to attack. Deans would have to be questioning the continuing inclusion of Cooper – he was rubbish today. The Wallabies won despite playing like shite, and they haven’t hit their stride yet. The All Blacks weren’t convincing against a brave Argentina.